Accurate transcription of unrestricted spontaneous speech, produced by unknown speakers and in a wide variety of environments, is beyond the capacity of today's state-of-the-art systems. Advances are needed to develop technology that is robust to changes in topic, speaker, speaking style, transmission channel and environment, and that is able to adapt in a transparent manner to the new conditions. It is widely acknowledged that recognition performance remains highly dependent upon the task, the speaker, speaking style, recording and environmental conditions, etc. There can be huge differences in word error rates across speakers, ranging from 1-2% for the best speakers and well over 30% for the worst ones. Recently spoken language translation research has also reached important advanced. Results seem promising. The task of helping professionals with automatic transcription and translation of broadcast news and speeches is not any more a dream. In this paper, recent results obtained in the field are presented in the framework of TC-STAR, an EU Integrated Project launched in 2004. Finally, real experience carried on in our Institute with RAI, the Italian national Broadcaster, and the Italian Parliament is presented. Automatic transcription of audio signals aims at generating word level transcriptions and meta-data (e.g. speaker gender identification, named entity detection, punctuation, etc.) that can be exploited for several purposes such as automatic indexing, automatic summarization, machine translation, etc. Transcription systems rely on leading-edge technology for large vocabulary speech recognition and are applied in many different application domains such as transcription of broadcast news programs, audio-visual documents (e.g. historical films and documentaries), meetings, lectures, speeches delivered at conferences and at parliamentary assemblies, phone calls, etc. Automatic transcription of an audio signal is usually performed in several stages: first the input signal is partitioned into acoustically homogeneous regions and signal chunks containing speech are identified and clustered on the basis of their spectral similarity. Then, speech segments are transcribed performing two or more decoding/rescoring steps interleaved by cluster-based acoustic model adaptation. Today's most popular approaches to large vocabulary speech recognition are based on statistical models of the speech signal. The main issues concern acoustic-phonetic modelling, pronunciation modelling, language modelling, decoding and model adaptation. Advances are needed to develop technology that is robust to changes in topic, speaker, speaking style, transmission channel and environment, and that is able to adapt in a transparent manner to the new conditions. Recognition performance of a transcription system is usually expressed in terms of a measure of the average number of errors which is called �word error rate�. As an example, on unrestricted broadcast news data state-of-the-art transcription systems achieve word error rates around 20%. However, transcription performance varies a lot across data types. For American English, the average word error rate reported on prepared, announcer speech is about 8% in the DARPA benchmark data. Performance decreases substantially for spontaneous portions (average word error 15%), degraded acoustic conditions (average word error 16%), or speech from non-native speakers (over 25%). Recognition experiments (exploiting manual segmentation of speech turns) carried out within the TC-STAR (Technology and Corpora for Speech to Speech Translation) project (www.tc-star.org), concerning transcription of the speeches delivered in English and Spanish at the European Parliament during plenary sessions, resulted in average word error rates around 11-12% (see http://www.tc-star.org/documents/deliverable/tcstar_d7.pdf). � They are able to handle only restricted domains (like appointment scheduling, conference registration, travelling and/or tourism information). � The vocabulary is restricted to about 5000 to 10000 words. � Even for the best performing systems and approaches, fairly high sentence error rates are reported. � language model Pr(T), i.e. to model the structure of the target sentence at all levels (lexical, syntactic, semantic,...). � statistical learning: the parameters of the language, alignment and lexicon models must be learned from example data and resources such as monolingual and bilingual training data, bilingual dictionaries, morpho-syntactic analysers etc. � generation (or search) task: the target sentence with the maximum probability has to be determined. This generation must be able to handle large vocabularies. � integration of recognition and translation: when handling speech input rather than text input, the statistical approach as to take into account both the ambiguities of the speech recognition process and the ungrammatical and disfluent nature of the spoken language. The principles on which the statistical approach is based were worked out only around 1990. Considerable progress has been made since then due to improvements in the underlying models and algorithms and to the availability of bilingual parallel corpora and greater processing power. Recently, for written language translation with large vocabularies (about 50000 words), it was also found that, as a result of this progress, the statistical approach is able to produce competitive results with conventional translation systems that had been optimized over decades. Figure 1: A spoken language translation chain including speech recognition and translation under development at ITC-irst. In Figure 1 the spoken language translation chain under development at ITC-irst is described. Language is a topic of major importance for the construction of the European Union, which is of economical, cultural, political and social nature. The effort to address such crucial issue appears to be too large for the Commission alone, and it seems to be necessary to have this effort shared between the Commission (which has the duty to ensure a good communication with the member states, and among the member states), and the member states which have to preserve and promote their language(s), and through their language(s), their culture. For this reason the Commission, in the V and VI frameworks, identified HLT as strategic objective. When there were just 15 member states with 11 official languages, the European Union spent 549 million euros on translation. With 25 states since May of 2004, the EU now has 20 official languages. And the number of language pairs for translation jumped from 110 to 380. The economic costs of language translation are very large, and growing. Consider another aspect of the language equation: recent studies show that European citizens prefer Web sites in their own language. Most would not agree to filling in a tax form in a language not their own. Understandably, most people would object to a lack of newspapers in their own language. The importance of language will become evermore critical as the EU moves forward as an information society. Language is the main instrument of communication for work, travel, and home. The social costs of language translation cannot be ignored. Clearly public institutions and the private sector need a solution to the issue of language translation. Automated language processing technology can provide solutions for translation, information query, and other cross-lingual applications. In fact, language technologies have been a strategic research topic since the V Framework program. The result is that some European public research institutions and private companies have developed leading language technologies. They are competing well against US institutions at the technology level. In Europe, a large number of national and international initiatives have taken place in recent years, covering core language technologies such as speech recognition, machine translation, speech synthesis, information retrieval, and question-answering systems. A number of successful technologies have been developed and some even successfully deployed. However, there remain several areas where technologies are difficult to deploy, a big factor being unknown performance. Performance evaluation is one of the most important objectives of the TC-STAR (Technology and Corpora for Speech to Speech Translation) project. TC-STAR is a project funded by the European Commission within the �VI Framework Programme. The TC-STAR Consortium brings together prominent European players in the speech technology field, including both basic research institutes and universities, as well as large companies with years of experience in the field. The Consortium itself is a first step towards reinforcing the European Research Area, and offers a unique opportunity to place Europe in a position of leadership in speech-to-speech translation (SST) technologies. TC-STAR has the ambitious goal: to make a breakthrough in SST research that significantly reduces the performance gap between humans and machines. TC-STAR represents a long-term effort focused on advanced research in core language technologies: speech recognition, speech translation, and speech synthesis. In the TC-STAR project two translation tasks are investigated:� translation of speeches delivered at the� European Parliament during plenary sessions� and a broadcast news translation task. For the European Parliament Plenary Session (EPPS) task, two directions of translation are considered: from Spanish to English and from English to Spanish. In the broadcast news� translation task,� translation from Chinese Mandarin to English is considered. Within the project, in March 2005, an evaluation campaign was carried out to evaluate performance of spoken language translation systems developed by several� research groups. As an example, on the EPPS task, by assuming manual segmentation in turns,� the best system can get 65% of the words correct, ignoring the word positions. Even if this result is far to be perfect, it is very encouraging as it is achieved on �a real-life task (see http://www.tc-star.org/documents/deliverable/Deliv_D5_Total_21may05.pdf). � ������������� ��Figure 2: Block diagram of �the automatic transcription process. The ITC-irst transcription system [4,5,6] includes all the main processing steps outlined Section 2, that make it possible to accept a signal of unknown contents, including non-speech portions, and produce a transcription of the speech portions, along with a classification of signal portions with a combination of different categories: male/female voice, wideband/narrowband speech, silent/noisy/background, etc. A block diagram of the transcription process is depicted in Figure 2. Speech recognition exploits context dependent Hidden Markov Models, a 64K-word trigram language model (LM), beam-search Viterbi decoding, and maximum likelihood linear regression (MLLR) acoustic model adaptation. Speech segments are transcribed performing two decoding passes interleaved by cluster-based acoustic model adaptation. Word transcriptions of the first decoding step are used as supervision for acoustic model adaptation. The acoustic front-end uses a sliding window of 20ms, with a step of 10ms, to compute 13 mel-scaled cepstral coefficients and their first and second order time-derivatives. Mean normalization is applied to static features. For transcription of the news programs broadcasted by RAI, the major Italian broadcaster, acoustic models are trained through a speaker adaptive acoustic modelling procedures  by exploiting recordings of from broadcast news programs. Two sets of acoustic models were trained by exploiting for each set about 140 hours of speech. The LM was estimated on a 226M-word corpus including newspaper articles, for the largest part, and BN transcripts. Finally, the LM is compiled into a static network with a shared-tail topology . By considering entire broadcast news programs, the system achieves, on average, a word error rate around 12.9%. Details on performance achieved are reported in Table 1. Reported results are for a single pass decoding process and for a two passes decoding process exploiting cluster-based speaker adaptation. In the row New most recent recognition results are reported which can be compared with official results obtained on this task 2 years ago and reported in the row Old. Relative reductions in word error rate are also reported in the Table. Recognition results are reported by considering entire broadcast news programs (column Overall) and by considering separately wideband and narrowband speech. Reported relative reductions of the word error rate show that significant advances have been made under all conditions. In particular, for the reference transcription system configuration, which makes use of two decoding steps, a relative word error reduction 19.4% can be observed. ���������������� Table 1: Word error rates achieved on the Italian broadcast news transcription task. Currently, the ITC-irst transcription system is in use at RAI for automatic indexing of huge archive of audio-visual� documents in the context of an information retrieval application . The ITC-irst transcription system was recently adapted to cope with transcription of speeches delivered at the Italian Parliament Assembly. Preliminary transcription experiments resulted into a word error rate of about 12%. Work is ongoing to further tune the system components to this specific task. The aim is to develop a system for helping professionals in quickly producing high quality minutes of the parliamentary debates. Franz Joseph Och, Hermann Ney. A Systematic Comparison of Various Statistical Alignment Models. Computational Linguistics 29(1): 19-51 (2003). Stephan Vogel, Alicia Tribble. 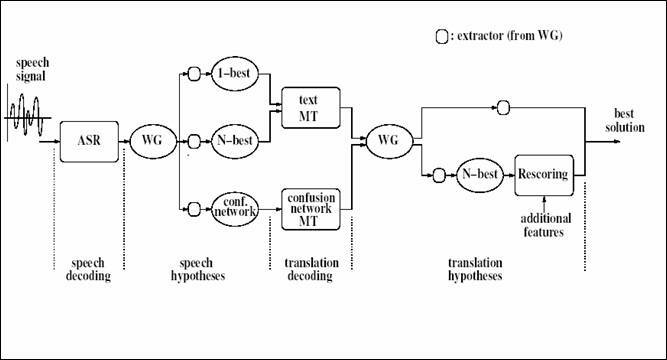 Improving Statistical Machine Translation for a Speech-to-Speech Translation Task. In Proceedings of ICSLP-2002 Workshop on Speech-to-Speech Translation. Denver, CO. September 2002. Lazzari G. Spoken Translation: Challenges and Opportunities. In B. Yuan, T. Huang, X. Tang (eds.) Proceedings of 6th International Conference on Spoken Language Processing, Beijing, China, October 16-20, 2000, vol. IV, pp. 430-435. F. Brugnara, M. Cettolo, M. Federico and D. Giuliani. Advances in Automatic Transcription of Italian Broadcast News. In Proceedings of ICSLP, Beijing, China, October, 2000, pp. 660-663. N. Bertoldi, F. Brugnara, M. Cettolo, M. Federico, and D. Giuliani. From broadcast news to spontaneous dialogue transcription: Portability issues. In Proceedings of ICASSP, Salt Lake City, UT, 2001, vol. 1, pp. 37-40. F. Brugnara, M. Cettolo M. Federico and D. Giuliani. Issues in Automatic Transcription of Historical Audio Data. In Proceedings of ICSLP, Denver, CO, September, 2002, pp. 1441-1444. D. Giuliani and M. Gerosa and F. Brugnara. Speaker Normalization through Constrained MLLR Based Transforms. In Proceedings of ICSLP, Jeju Island, Korea, 2004, pp. 2893-2897. �N. Bertoldi, F. Brugnara, M.Cettolo, M. Federico, D. Giuliani E. Leeuwis and V. Sandrini. The ITC-irst News on Demand Platform. In Proceedings of the European Conference on Information Retrieval Research, Pisa, Italy, April 2003.